Home / NEWS / Joint Press Statement: Terminate Arbitrary Detention of HR Defenders! Terminate arbitrary detention of HR defenders! 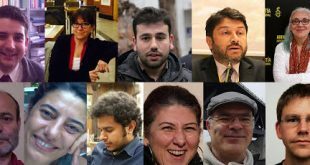 It has been 40 days since 10 human rights defenders, whose fundamental position is to advocate for human rights and freedoms, gender equality and human safety, were detained in the early hours on the morning of 5 July 2017 upon the warrant issued by the Office of the Chief prosecutor of Adalar-İstanbul on the fourth day of a series of meetings held as an activity of Human Rights Joint Platform in an open and transparent environment, and undertaken with the knowledge, approval and initiative of human rights organizations in order to understand the threats and risks arising from the ongoing developments, which have a direct impact on the work of the HRDs; to better equip them vis-à-vis such risks; and to protect them, their work and the rights’ subjects they are working together on the digital and virtual environment. The process continues with 8 of the said 10 in remand and 2 released on parole. Turkey is a State under liabilities stemming from the human rights conventions of the United Nations and of the Council of Europe, which need to be honored pursuant to article 90 of the Constitution of the Republic of Turkey. Lengthy arbitrary remand periods followed by arbitrary arrest warrants against HRDs based on the statement of an anonymous witness in the absence of any evidence, are in breach of constitutional articles 15 and 90, which prescribe human rights and freedoms that cannot be confined even in times of state of emergency. We would like to recall that circulars no B.03.1.HSK.0.70.12.04- 010.06.02-135-2011 and 10 of 18.10.2011 of the (High) Council of Judges and Prosecutors enshrine that during the course of an investigation, human rights violations must be prevented; evidence must be gathered in a timely manner and in accordance with the relevant procedures; persons and institutions must not be aggrieved; and more importantly –for the sake of building people’s confidence in the judiciary– public prosecutors conducting the investigations must act with utmost sensitivity on the aforementioned points. We demand that our friends who are arbitrarily kept in remand be released right away. National legislation and international human rights law point out that the material and spiritual existence of a person who is impeached with an offence must be protected against all forms of unjust assault until the mandated court with jurisdiction unambiguously rules on whether he is, or he is not, guilty. The fundamental reason why the investigation phase encompassing the procedural stages at law enforcement and prosecution levels is “confidential” is to prevent smearing of the suspect’s name and to protect his dignity and honor. However such a protection has not taken place. Since the day our friends were taken into custody, certain outlets from printed and visual media have been striving to steer both the office of the prosecutor as well as the general public, based on unfounded scenarios. These media outlets have published certain documents which even the defense lawyers have been unable to access, and which cannot be considered as criminal evidence –let alone constituting a motive for arrest– as “acquired documents” and have perverted facts by devising a new scenario every other day. No precautions have been taken against such perpetrators of, and disclaimers have yielded not results. The deliberate criminalization of an extremely legal and open training session, and the constant effort to portray the moderators and participants thereof as criminals, just eliminate all principles and values of law. It is unacceptable that the relevant authorities act merely as audiences in the face of this situation. As human rights organizations, we hereby announce to the public and the authorities that we will not remain as mere audience and that we will employ all national and international legal procedures so as to ensure that necessary safeguards are taken. In 12 years of experience since its foundation in 2005, the Human Rights Joint Platform (IHOP) has organized numerous consultation, training and dialogue meetings with public institutions and rights-based civil society organizations, and has gained a respectable place with the contribution it made to the protection and promotion of fundamental human rights and freedoms in Turkey with its founding and member organizations. One of the priority areas of work is the dissemination of information on human rights norms and standards, the strengthening of dialogue and cooperation with the public administration for the protection and strengthening of human rights and freedoms as well as the protection and empowerment of human rights defenders. In this framework, it conducts joint activities primarily among its members as well as with other networks and civic organizations that strive to protect and strengthen human rights and freedoms. Effective and reliable reporting and monitoring, strengthening human rights defenders’ (HRDs) knowledge and skills in the field of human rights, enhancing HRDs capacity to cope with secondary trauma and protect themselves from all external threats are among the founding objectives of IHOP. The training workshop, where 10 human rights defenders were detained in the morning of 5 July 2017 in a raid conducted by approximately 30 police officers under the instructions of the Istanbul Adalar Chief Public Prosecutor’s Office, was one of the training meetings of IHOP. The decision to organize this meeting had been taken jointly by the members and executives of IHOP member organizations (HRA, Citizens Assembly, Human Rights Agenda Association and the Turkey Branch of Amnesty International) at the consultative meeting held in Antalya on between 7and 9 April 2017. The purpose of this meeting was to understand the threats and risks emanating from the current environment and which directly impact the work of human rights defenders, increase their skills against these risks, protect themselves, their work and those they work with from the threats of the digital and virtual environment and learn methods for coping with the secondary traumas they are exposed to. Information about the meeting which the written and visual media is trying to criminalize, has been explicitly reported in the Information Note No.1 we shared with the public on July 11, 2017, after the detention of human rights defenders. The signed version of our Information Note dated July 11, 2017 has also been delivered to the Istanbul Chief Public Prosecutor’s Office. In addition to the information note, the documents related to the meeting which were delivered to the prosecutor’s office through the lawyers clearly show that the meeting was held with the approval and knowledge of the executives of member organizations forming IHOP. The news reported by “media” organizations stated that this meeting had not been announced. We should clearly underline that CSOs do not have the obligation of announcing or notifying their work and meetings in advance. Following the amendment made to the associations’ legislation in 2005, the former obligation to notify meetings held outside association buildings was abolished. Therefore, the expression “meeting previously not announced” which was constantly emphasized and presented as a legal obligation in the defamation campaign launched by the visual and written media organs is extremely misleading and has been designed to give credence to another scenario to be created. Unfortunately, it is worrisome and contrary to the principle of lawfulness that the same expression has also been used in the summary of proceedings (fezleke) prepared by the Prosecution Office, which referred our friends to the criminal peace judge by demanding their arrest. This Information Note, which is a continuation of Information Note-I, has been prepared to put forward the processes and problems regarding the detention and arrest of the HRD members and friends participating in the IHOP workshop, which had been interrupted with the detention of participants upon instructions of the Office of the Chief Public Prosecutor of Istanbul Adalar pursuant to a complaint lodged by a secret witness the day before the final day of the meeting. • The meeting premises were raided in the morning hours (10: 00-10: 30) and although the detention process had legally begun, it took until 14:30 for the detention process to be put down in the official records. 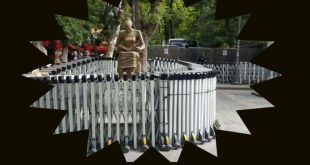 • At the beginning of the detention process, the rooms and suitcases of the 10 human rights defenders participating in the meeting were searched, and their computers, phones and many other personal belongings were seized. • Although legally the images of the telephones and computers should be taken and then they should be returned, this procedure has still not been conducted. • Requests to inform the relatives and lawyers of the 10 detained HRDs have been rejected due to the prosecutor’s decision for a 24-hour communication ban. And we have learned about the detention of our friends merely by coincidence. • Our friends who were detained at the Büyük Ada police station until midnight on July 5, were later distributed to different police stations on the Anatolian side of Istanbul; they have only been able to communicate with their relatives and friends after 14.30 on July 6, 2017, following the lifting of the communication ban. • None of the detainees’ statements were taken during the 7-day detention period, however home calls were made on the 6th day and the detention periods were arbitrarily extended by 7 more days. On 17.07.2017 (Monday), the 13th day of the detentions, circa 09.00 a.m., 10 HRDs were taken from İstanbul Security Directorate to İstanbul Çağlayan Court House. Their interrogation by the prosecutor were completed by the evening hours; however, the decision of the prosecutions was not announced till midnight. With a demand for their arrest, the prosecutor asked that our friends be referred to İstanbul Criminal Judge of Peace no 10. The interrogation by the office of the judge started after midnight, and was completed on 18.07.2017 at 06.30 a.m., following which 4 of our friends were released on parole while the other 6 were arrested. • They were taken to prosecution’s interrogation after a long stay of 13-days in remand. • Following the first detention period of 24 hours, the investigating prosecutor ruled for confidentiality on the file. • At the prosecution stage, information as to the attributed offence had not been explained to the applicants and their lawyers in a sufficient manner to enable their defense, the grounds had not been indicated, and they were not allowed to peruse the dossier or look into the evidence, if any, as regards the offence attributed to them. • The investigating prosecutor did not take himself the statements of many of our friends, and referred them to arrest without even seeing them. Following the arrest warrant, Günal Kurşun and Veli Acu were sent off to Metris prison while Ali Garawi and Peter Steudner to that in Maltepe, and İdil Eser and Özlem Dalkıran to Bakırköy Women’s Detention House. Following the admission by the Office of the Criminal Judge of Peace of the investigating judge’s objection to the parole decision, Nalan Erkem and İlknur Üstün were taken from their houses early in the morning on 22 July 2017 and brought before Peace Judge no 10. After the interrogation finished in midnight, an arrest warrant was issued thus Nalan Erkem was taken to Bakırköy Women’s Closed Prison while İlknur Üstün to that in Sincan. On the other hand, Nejat Taştan and Şeyhmuz Özbekli went to the court house themselves on 24 July 2017, and following a long wait, were interrogated then released on parole by the Criminal Judge of Peace. Lawyers’ appeal to the remand decision was declined on 1 August 2017 by the Office of the Criminal Judge of Peace no 11. The said office ruled for absolute continuation of remand, evaluating the objections made with regard to the offence “aiding an armed terrorist organization” attributed to our friends as not appropriate. Having been first released on parole yet later taken in remand once again upon the objection by the investigating prosecutor, the appeals with respect to the arrests of Nalan Erkem and İlknur Üstün were, too, rejected on 9 August 2017. • Following the rejections of the objections to the remand decisions, all our arrested friends were taken from the prisons where they had been kept to the campus of Silivri Closed Penitentiary Institution and placed in separate wards of 2-3 people capacity. • At present, Veli Acu has been in solitary since he had been sent off to Silivri, and for 14 days now, he has been subjected to isolation. 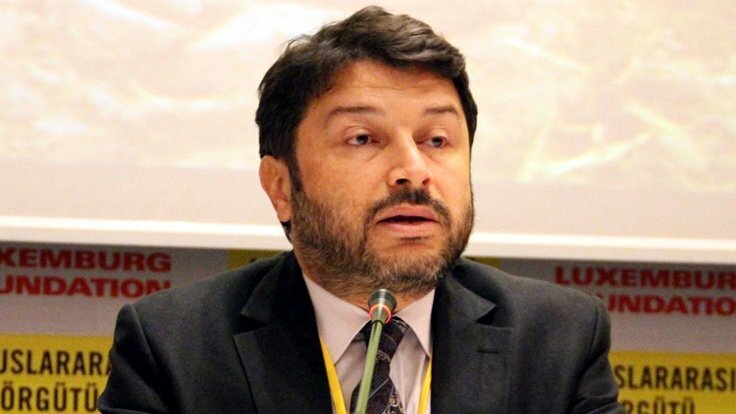 In addition to the petition submitted to Silivri Prison Governorate by Günal Kurşun and Veli Acu, executive board members of Human Rights Agenda Association, to stay together, that of Veli Acu to participate in physical exercise, too, have been refused. • Ali Garawi is staying with an inmate, who cannot speak a foreign language thus has been deprived of communicating with anyone else other than his lawyers. • In spite of the fact that due to an ailment before her arrest, Nalan Erkem has to follow a strict and delicate nutrition program, and be under constant medical checks, this condition of hers has been ignored. Since the food served for the whole prison does not comply with the special diet she is constantly losing weight. Due to the medical problems she has, the ongoing detention increases the risk of being caught by cancer. • In spite of the fact that İdil Eser’s health requires a constant monitoring due to cancer suspicions and that the medical reports on her condition had already been submitted to Bakırköy Prison Governorate, no progress could be attained in this respect. İdil Eser’s colon thickening was under chaos due to the risk of cancer .. The loss of her mother and her grand mother’s early colon cancer further increases this risk. The size of the cyst in his uterus is at the threshold of surgery. In idil, where the reiner’s disease is detected, there is a potential to cause ear-drling and balance problems due to stress. She is allergic to asthma and is constantly using medications. The difficulties in accessing the drugs currently used for anxiety and depression have not been solved yet and the continuation of detention increases the risk of serious health problems of İdil Eser. On 10/8/2017, the irregularity of the arrest warrant and the continuation of the imprisonment, as well as the continuation of the irregular detention, demanded that this situation, which was investigated once a month by lawyers applying for serious health risks. • Letters sent to our friends are not delivered to them. Therefore their communication with the outside world has been limited to the one-hour-visitation/week from their families and lawyers. • Our arrested friends are not seeing their lawyers alone. Thus, as the principle of presumption of innocence is violated and defence rights are directly restricted. Limitation of their right to see their lawyer as oonly one hour in a week under recording with camera and with the accompaniment of a prison guard is clearly against the basic legal norms. These restrictions are implemented arbitrarily by the prison administration as there is no notification has been sent to lawyers and there is no decision of the Peace Criminal Judge decision for these restrictions and practices. The first news reports of smearing nature against the HRDs started to appear on the midnight of 5 July 2017. 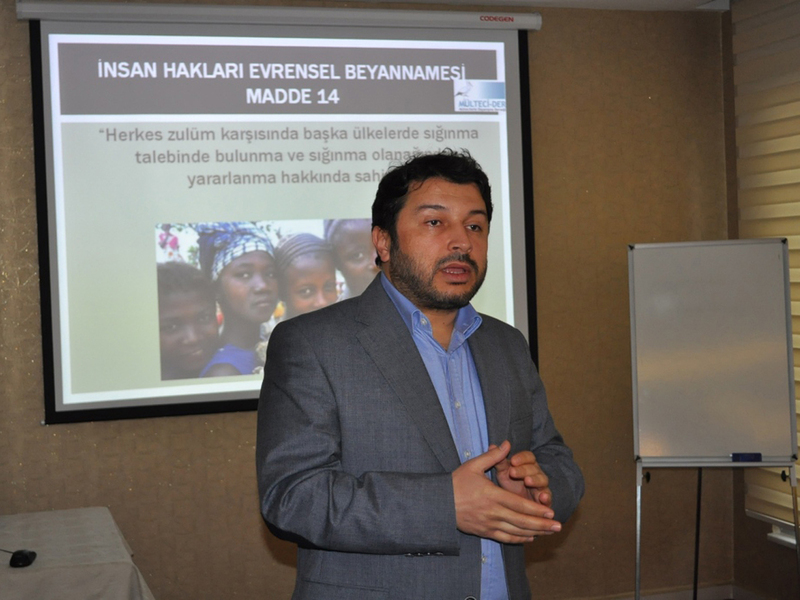 The content of the reports which started to come out on 6 July 2017, approximately 12 hours after the detention of our friends, was observed to have been aiming at establishing a link with the İHOP HRD training session and another currently-investigated-meeting held in Büyükada during the 15/7 coup attempt. The “media” outlets, which alleged that the training session was a secret meeting, did not attempt to obtain any information either from İHOP (Human Rights Joint Platform) secretariat or from any member association thereof. They did not attend the press conference that we held and did not report on the Information Note that we issued. During the course of the days-long heavy smearing campaign, in order to steer the general public, documents and materials seized by the police at the meeting room and the rooms of the participants were exploited by certain media outlets as an incriminating perception instrument against HRDs and their organization even before the prosecution started the interrogation and when a confidentiality ruling had been rendered on the case. HRDs have been branded as spies, traitors, chaos-builders etc. In numerous news reports, dignities, honors and prestige of the HRDs were insulted through defaming accusations. Their photos were associated with words like spies, operatives, traitors etc. and they have been placed on the target board. The interrogation records the Office of the Criminal Judge of Peace, which was approached with a request for arrest on charges of “aiding an armed terrorist organization” following the prosecutor’s investigation on 17 July 2017, could only be put in a report by a [court] expert on 31 July 2017. In spite of the fact that our friends’ answers to the interrogation questions and the evidence presented by their lawyers were included in the said report, the media outlets involved in the smearing and slander did not rely on the report, and continued with their campaigns in breach of the provisions of the Turkish Criminal Code that consider insult and slander an offence and foresees confidentiality of investigation. Disclaimers have not been responded to. As human rights organizations, we would like to underline once again that we will not remain silent in the face of all of these and of the smearing campaign faced by our friends and our organizations, and that we will resort to every legal means in order to protect our rights.